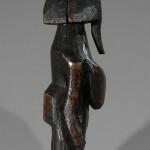 This is a very stylized abstract Mossi female figure carved from wood by village smiths and carvers, with heavy breasts and wearing a special and ceremonial coiffure for initiations This one is a rare example of a Mossi ‘mother’ figure quite unusually carved with a wonderful patina from use, and the bottom of the figure shows good signs of age as well. 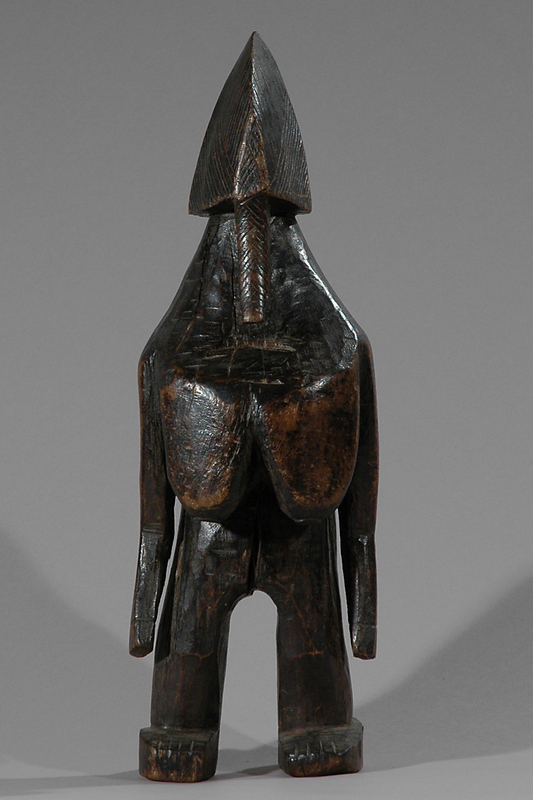 It is an unusual representation of a Mossi figure with legs. The curl in front of the face correspond to the way the young girls leave some of their hair braided in front of their face (mèche de cheveux). 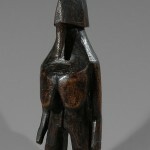 The figure looks very surrealistic and must have been used for medical purposes as we see some wood scraped of at the breast level. Usually such figurines are carved in small size. Among the Mossi such as works called biiga. The Mossi are today the largest single group living in Burkina Faso. They are renowned for their masquerades and their use of large superbly sculpted and brightly painted masks and colorful costumes. 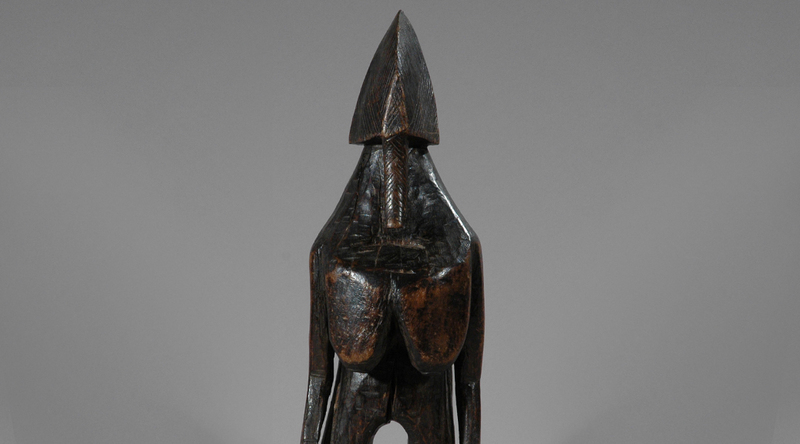 Among the Mossi, elders are highly honored with elaborate funerals and the appearance of masked dancers with masks representing ancestors and various spirits and forces of Nature in dramatic and often vigorous dances. 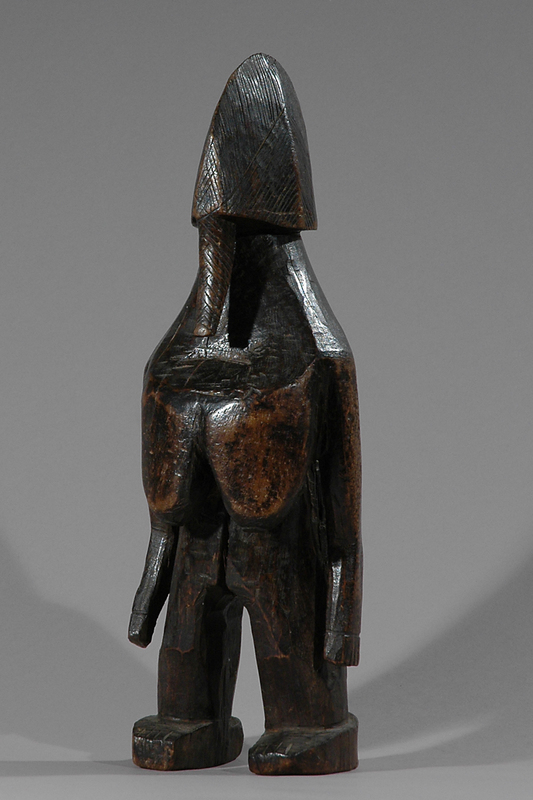 Sculpted figures known as Ninande (pl.) have a number of functions. 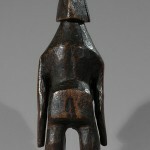 This stylized sculpted female figure has an unusual Mossi facial and bodylines and a strong neck. 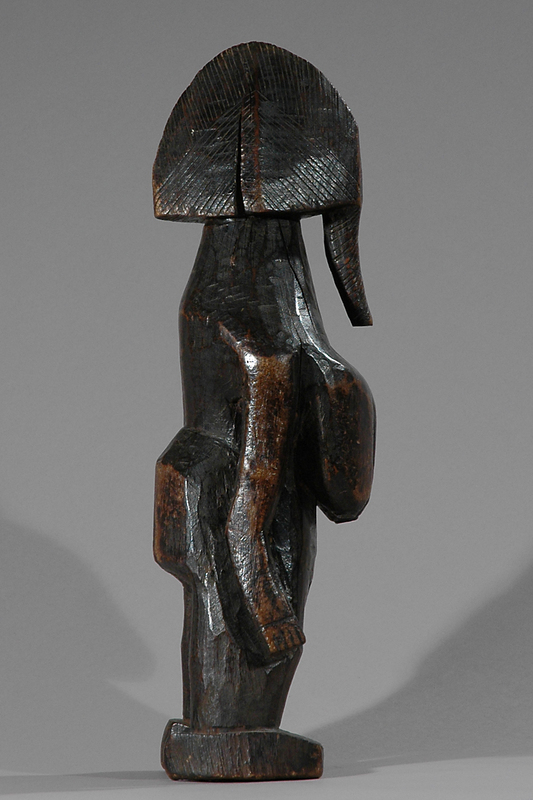 The high crested hairstyle is a version of gyonfo coiffure worn by the female among the Mossi. In general, figures are identified with local chiefs and clan elders during ceremonies reinforcing local political relationships and chiefly authority. 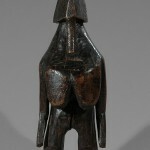 Figures are also used at funerals and are in some areas buried with the elder. During yearly public ceremony’s figures, honoring ancestors will have clothes wrapped around their waists similar to clothes worn by Mossi women. 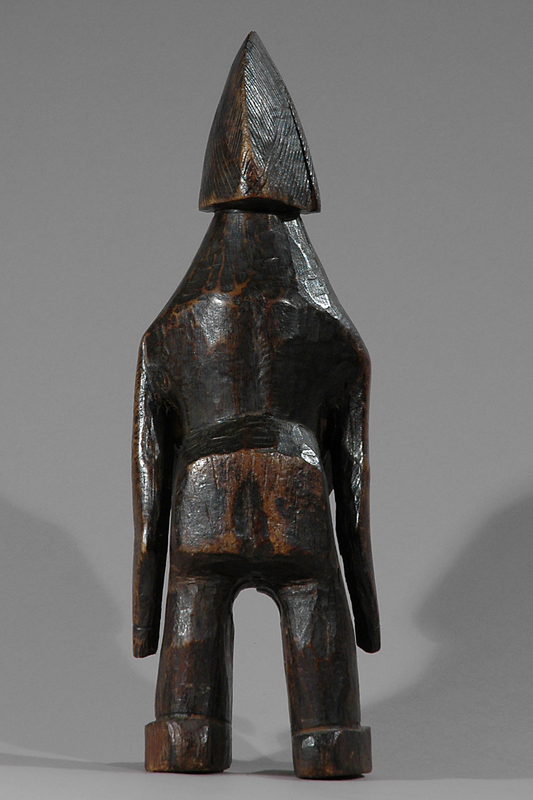 Among their many works is the “biiga” or doll; though the word doll is not a good translation of the word because the function of the sculpture goes way beyond that of ‘plaything.’ For a young female child the biiga represents the power that will enable her to have a child and simultaneously, the baby she is learning to take care of. Literature: Dagan, Esther A., African Dolls for play and magic, Montreal 1990, p. 48 f.
Read more: Roy, Christopher., The Art of the Upper Volta Rivers, 1987.